1. 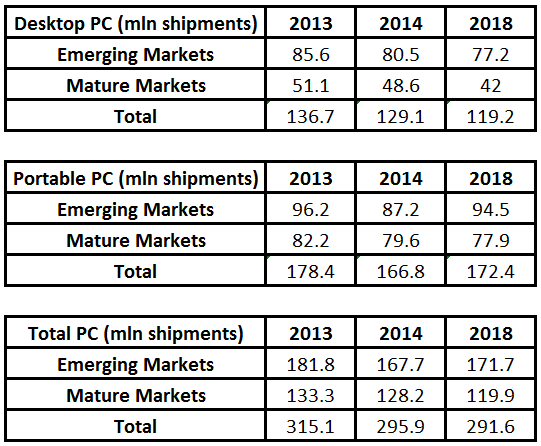 2013 saw PC shipments contract by 9.8%, the severest on record. 3. The weak economic environments in emerging markets coupled with significant shifts in device priorities is causing the decline in PC category. 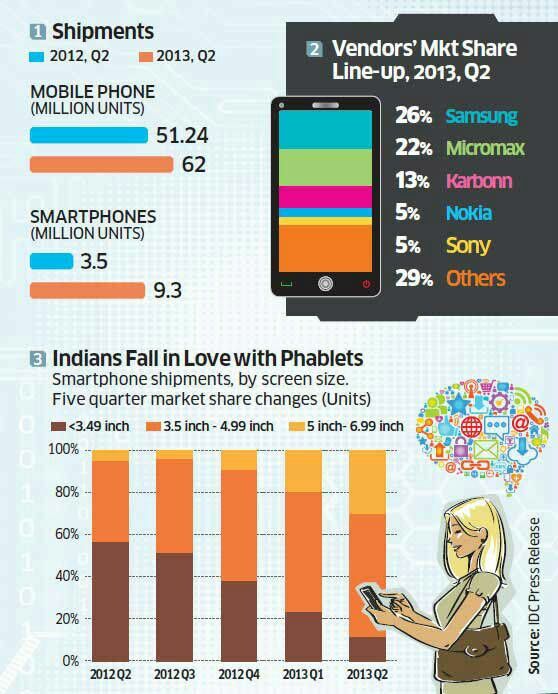 Indian smartphone markets is witnessing explosive growth in the smartphone segment primarily driven by lower priced smartphones from domestic handset makers are eating into market share of feature phones in India. 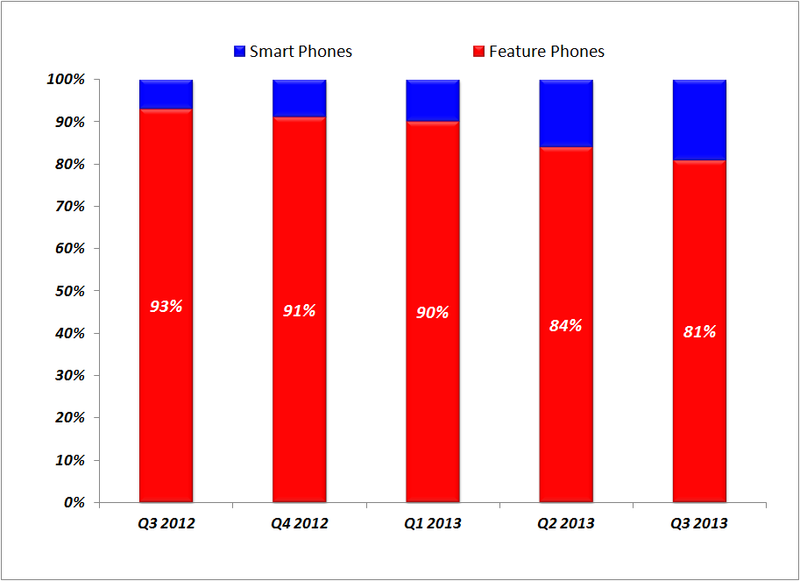 IDC’s Q3 2013 report records increase in smartphone numbers by 229% (YoY) to clock 12.8 mln units in Q3, 2013. The overall mobile phone market (Feature Phones and Smartphones) had a 12% growth YoY and a 7% growth quarter over quarter (QoQ) with the share of feature phones sliding further to make 81% of the total market in 3Q13 despite the feature phone market growing at 3% in 3Q2013 over 2Q2013. The growth trend in smartphones is expected to continue in the future because of the narrowing price points between high end feature phones and the entry price point of low end smartphones. 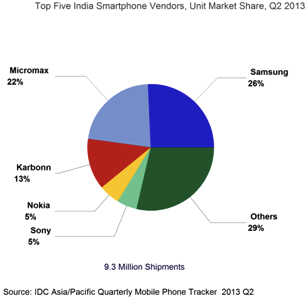 The overall India PC shipments for Q2 2013 stood at 3.53 million units, representing a substantial year-on-year growth of 24.0% over Q2 2012 and a quarter-on-quarter surge of about 30.2 % over Q1 2013. State-led manifesto driven spending on notebooks steered commercial investments in the India PC market in Q2 2013. Special projects currently being executed in states like UP, Rajasthan, and Tamil Nadu accounted for roughly one third of the total PC market size in Q2. However, the organic demand for PCs in India outside special projects has weakened, which remains a cause of concern for PC vendors. Further, the rupee slide derailed enterprise spending, as the investment decisions remained seemingly delayed across most of the verticals. The consumer market in Q2 witnessed a marginal growth over Q1 2013 aided by back-to-school campaigns and loading of stocks across partners in preparation to the impending price hike on account of rupee volatility. 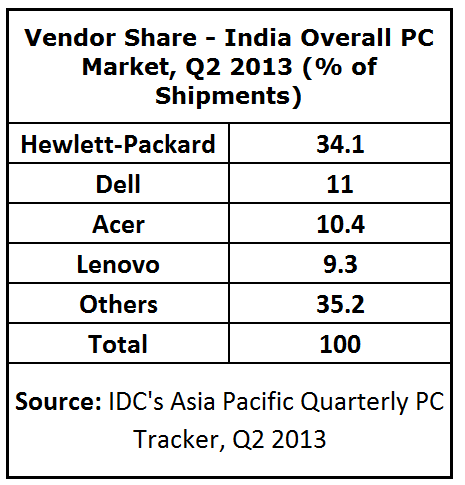 Even with Dell globally going south, Dell in India, took the second position with a share of 11.0% in Q2 2013. Their presence at the entry level price-band has given them much room to drive their volumes. Q3 has historically witnessed strong consumer buying in lieu of the forthcoming festive season in various parts of the country. This is also well aided by the back-to-school/college season and related campaigns undertaken by vendors and partners across different regions. 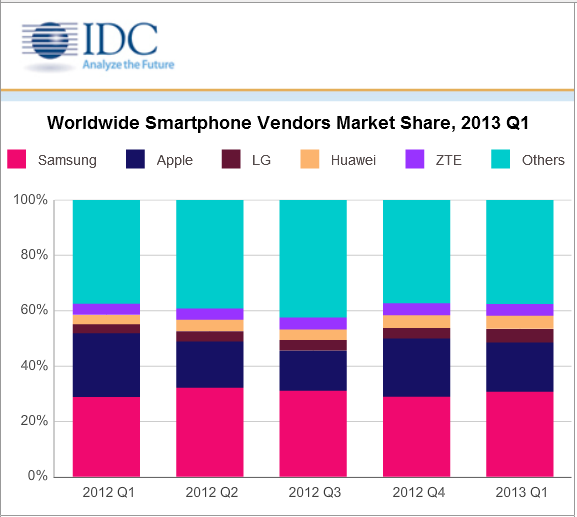 IDC expects 2013 to be no different. Consumer sentiments have peaked at the right time as they begin to reconcile with the market reality on inflation and related pressures. Retail walk-ins have improved and share of consumer wallet looks to move back to PCs, which is an encouraging sign for the consumer PC vendors. However, the PC business continues to thrive on wafer thin margins and it is still early to comment on the success of new form factors, which were anticipated to drive the overall value of this business. Also, outside special projects, demand from enterprises and government remain largely suppressed painting a gloomy scenario on commercial PC business, in the near future. Post PC or PC Plus? 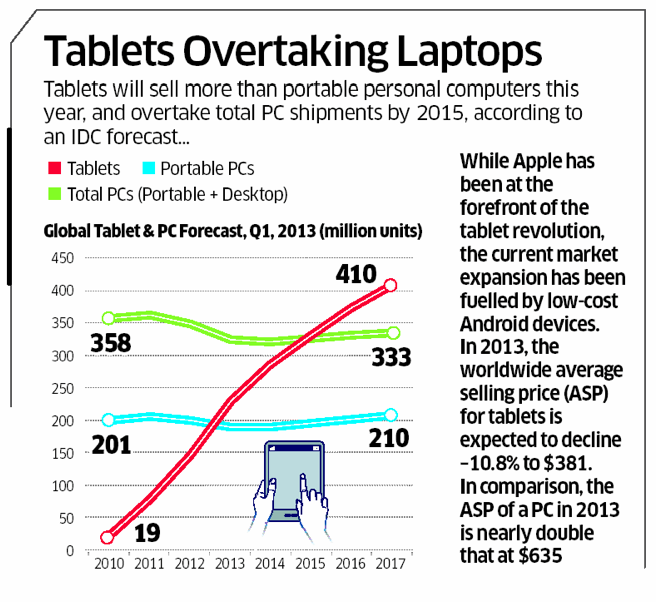 IDC in its most recent report indicates that Tablets will surpass Desktops globally by 2013 and notebooks by 2014. IDC indicates, global shipments of smart connected devices to have increased about 30% in 2012, surpassing last year’s 1 billion units shipped with $576.9 billion generated. Tablets pushed the growth rates with a scorching 78% YoY growth (2013 versus 2012). Notebooks will see a marginal growth of 0.9 percent. Tablets, are predicted to register a new high of 190 million units shipped in 2013 with year-over-year growth of more than 48 percent. IDC says smartphones will also grow another 27 percent, posting 918.5 million units shipments this year. 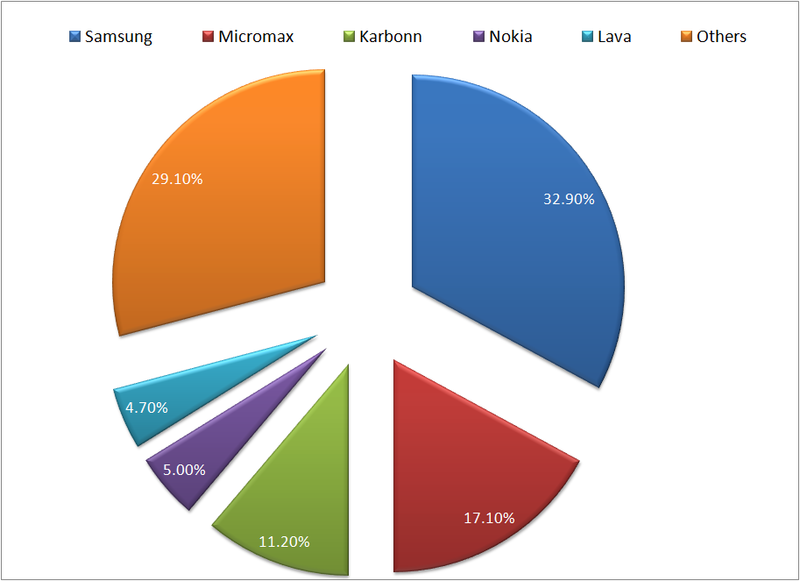 In terms of OEMs, Apple significantly closes the gap with market leader Samsung in the last quarter of 2012 with the combination of the iPhone 5 and iPad Mini bringing the company up to 20.3 percent unit shipment share as compared to 21.2 percent for Samsung. Interestingly enough then, PC majors such as HP and Dell would increasingly get outmoded by the likes of Amazon – the antithesis of device majors. So then, does this mean the end of the PC era? The Post PC era? … as Steve Jobs had crystal gazed. Well, it looks a certainity with these numbers and yet i would claim it as dawn of the PC plus era! Its a contrarian view given the convergence scenario – but i do believe that we will see a mobile stack of 4-5 devices going forward – Smartphone, Tablet, Notebook, Smart Watch or Google Glass and more (Smart TV, Smart Car and Smart Refridgerator not counted). Tablets will occupy a unique place. PCs will occupy a unique place – Physical keyboards are actually really important. Both devices will co-exist with more and more convertibility and ability to work together. The convergence eco-systems will also work on platform portability across the range of converged devices. Hence it is not so much as “passover” of the PC as the emergence of new computing devices which only add to the PC to further the case of always on ubiquitous computing. Long time back, i had been musing if Smartphones could become the primary mobile/handheld devices in the future. If IDC numbers are to be believed 2013, would the year smartphones would tip over feature phones accounting for 50.1% of the total mobile phone shipments. Further more over a 5 yr period, Smartphones will clock a 10.3% CAGR making up for a CAGR loss of 3% in feature phones by 2017, thereby growing the mobile phones category by 4%. 3. Open source eco-system that are pushing the economies of scale. As Smartphone breaks price barriers, the distribution and reach is reaching hitherto untouched segments and economies such as India, Brazil, South Africa, China, Indonesia. China has already topped USA as the top smartphone seller globally. the tablet below summarized IDC’s growth matrix for Smartphones on a global basis. 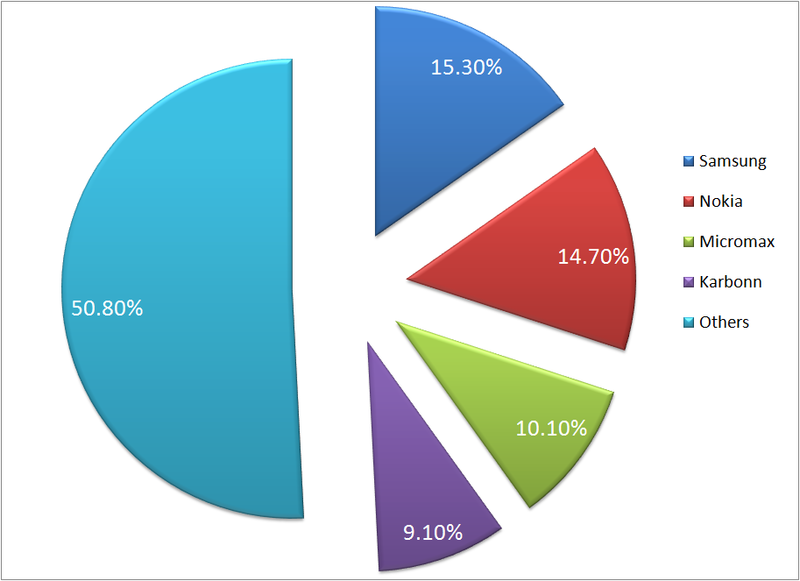 Now then to my favourite old question – A 70% Android share- Is that a tenable proposition even as the competition keeps increasing? Or do we see a new world order in Smartphone OS 5 yrs down the line? 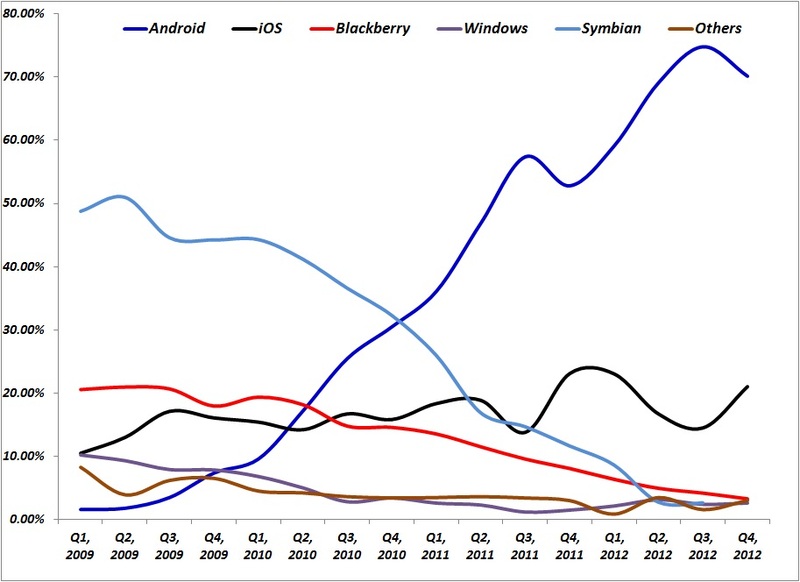 Or will Android become to Smartphone what Windows became to PCs? Platform extension may be the pointer and the answer to this. Another compelling thought – Will Smartphones give way to a more real time immersible experience such as Augmented Reality on Glasses or Contacts?